“Collect a lot” is the key phrase. Rhododendrons are, by far, his largest (over 1,000) and most varied collection. 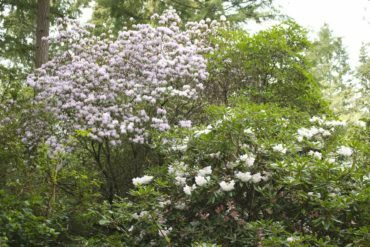 In addition, Bender has focused on certain plant groups: magnolia, daphne, viburnum, peony, Pacific Coast iris, hellebore and trillium primarily. 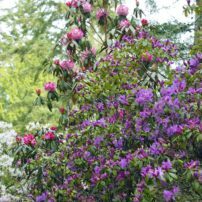 His rhododendron flowers range in color from white through all sorts of pinks and purples, to dark blood-red, scarlet, orange and yellow. 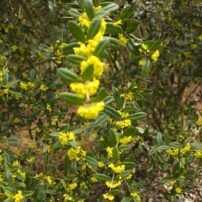 Some begin flowering in November, others in winter. 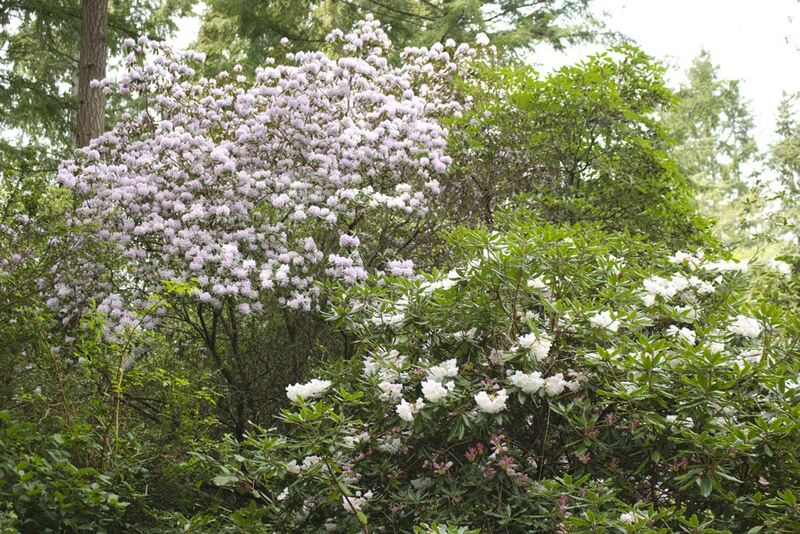 When the blooms peak in late April to early May, clouds of color dot Bender’s woods like an impressionist painting. Bender’s 4-acre parcel near Kingston is a mix of sun-baked hillsides, forested slopes and shady dells. It lacks a water source, utilities or any structure with four walls. And Bender only works on it from November to April each year. This is not a meticulously manicured garden. 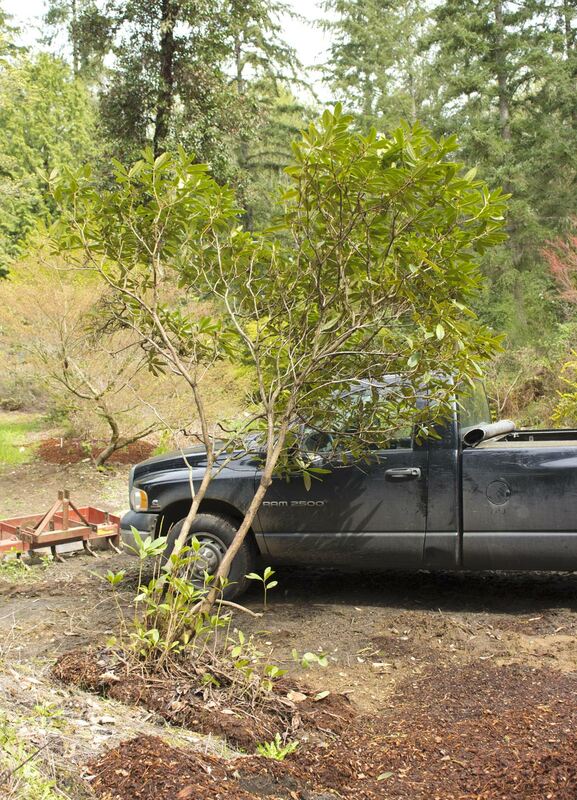 He keeps a tractor on site for large-scale jobs like moving mature trees and uprooting stumps. And Mother Nature is often allowed, even encouraged, to do her own thing. 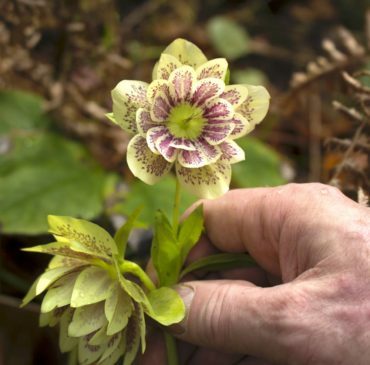 The property is, however, a treasure trove of rare and unusual plants, sourced over the past 45 years from plant collectors and hybridizers locally and around the globe. And it is a testing ground for Bender’s own plant-propagation efforts. Pulling a dried flower off a rhododendron, he breaks it apart to show a visitor the tiny, sliver-like seeds. 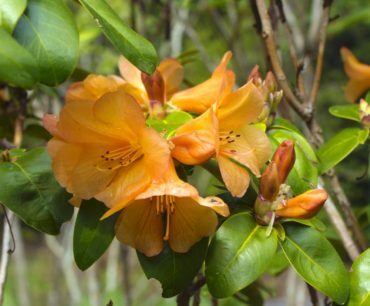 It’s hard to imagine having the patience to grow something like a rhododendron from seed. But Bender appears to enjoy the challenge of growing more of his unusual plants, as well as creating his own new crosses. 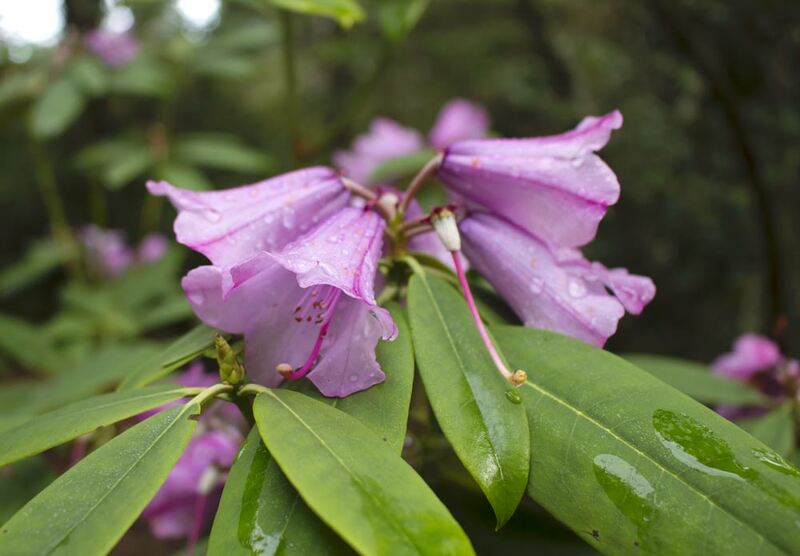 Bender began collecting rhododendrons in the early 1970s. At the time, he happened to work with a man who was in the local rhododendron society. “He showed me how to propagate from cuttings and from seed,” Bender said. The man also encouraged him to come to meetings of the society. 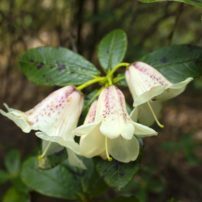 Many of the members at that time were of an earlier generation of plant explorers and collectors, most of whom have since passed away. They often traded cuttings or plants with each other. Bender said he acquired some exotic varieties from Asia that way. “After a few years, the yard was full, so I started looking for some land,” he said. In 1973, he purchased the Kingston acreage, where he could really indulge his hobby. Some of his oldest rhododendrons are now 40 or more years old. They range in size from majestic trees to knee-high dwarfs. Walking around the property, Bender points out specimens, often naming the person, garden or nursery from which he acquired them. 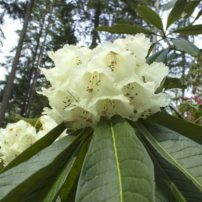 Rare, old, local cultivars like ‘Kingston,’ whose cream flowers have a red edge, and ‘Kitsap King,’ pink with a red center, came from early members of the rhododendron society. 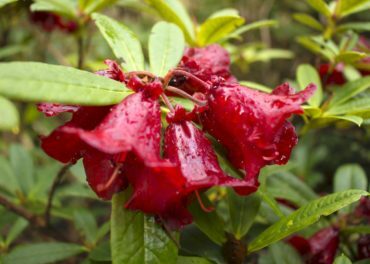 He also has a Rhododendron arboreum that was found by another local plant hunter at “the foot of a glacier” in the Himalayas. When asked if he has any interest in going on plant-hunting expeditions to Asia, Bender laughs and says something about strange foods. 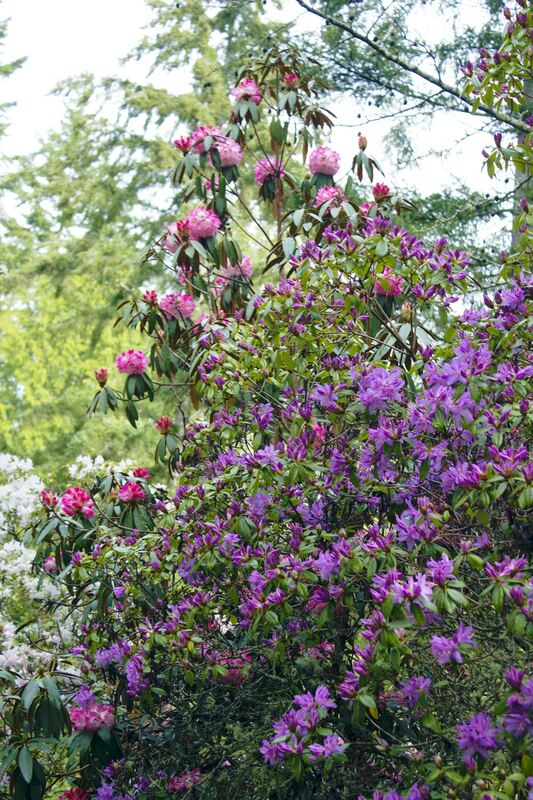 In the late 1970s, Bender did make two trips to famous rhododendron gardens in Great Britain, among them Leonardslee Gardens in England and Brodick Castle and Glendoick Gardens Nursery in Scotland. He has numerous mature plants he grew from the thousands of cuttings brought back from those trips. 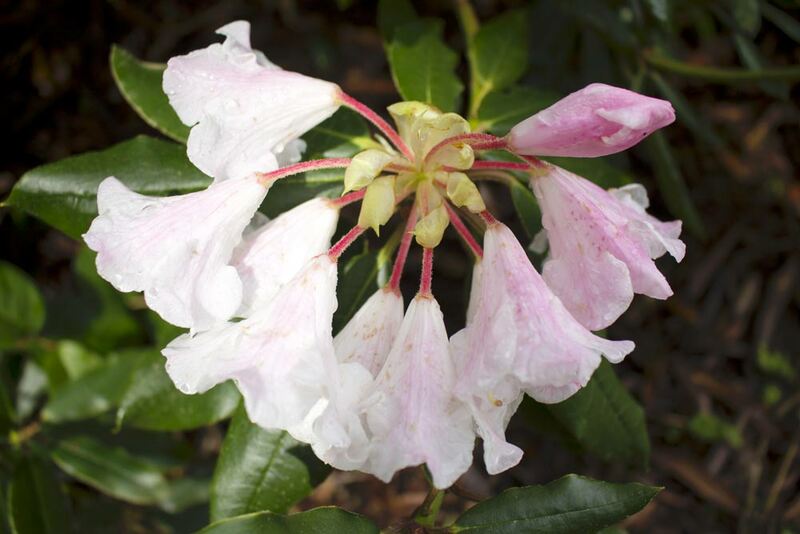 A white rhododendron, which has an intoxicating fragrance, is a cross of R. lindleyi and R. ciliatum developed at Brodick Castle. 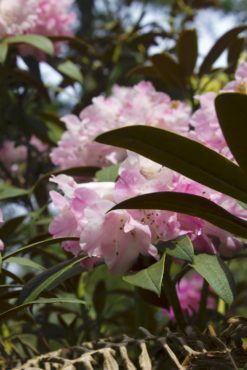 Another very fragrant one from that trip is the pale pink R. loderi ‘Venus.’ The loderi group are named for Sir Edmund Loder, a Victorian plant collector who bred them in the gardens at Leonardslee. 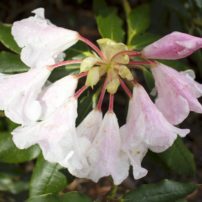 ‘Razorbill’ is part of a series of dwarf rhodies developed by Peter Cox of Glendoick Gardens. 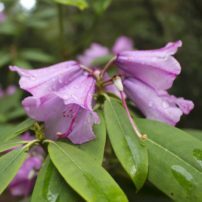 Bender said that Cox named “a whole herd” of rhododendrons after birds. 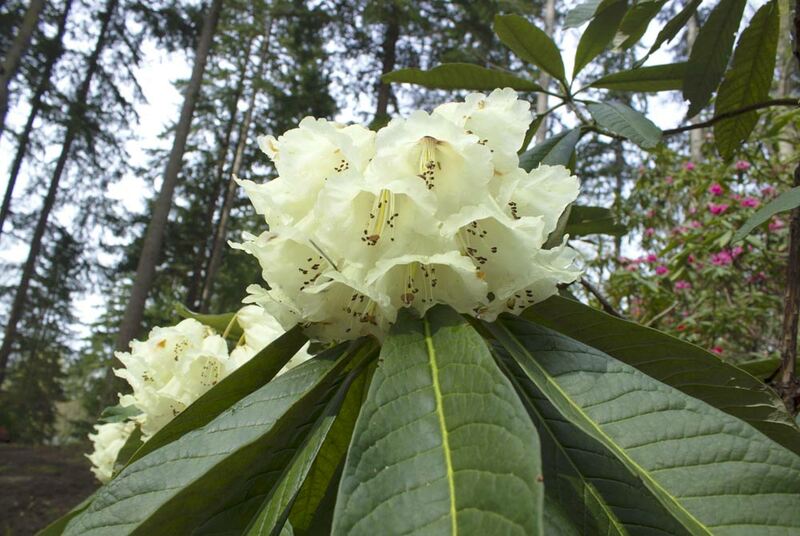 Some of Bender’s rhododendrons are impressive for their enormous leaves. R. montroseanum has leaves about 18 inches long, and R. sinogrande has even bigger leaves. By contrast, the dwarf R. anthopogon series has tiny leaves and a sweet little flower in white, yellow or pink. 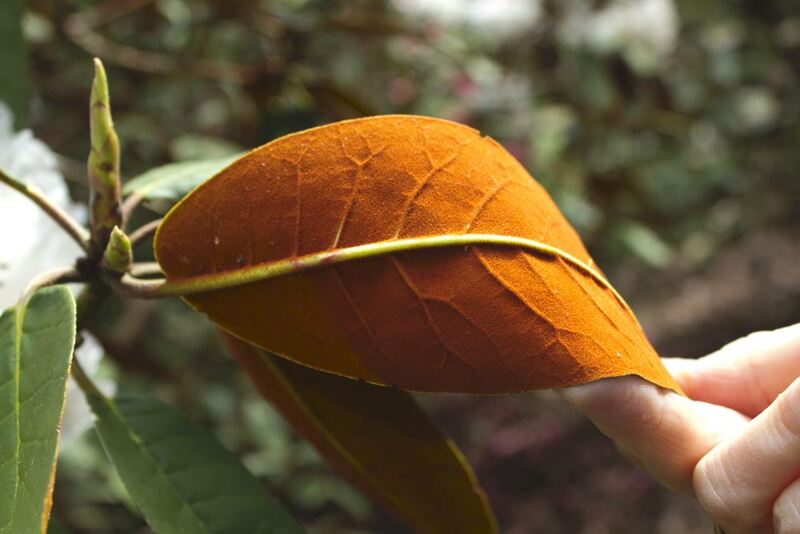 Some rhododendron leaves have a soft, suede-like undercoating called indumentum. White-flowered ‘Sir Charles Lemon’ grabs attention with its bright, cinnamon-orange indumentum. 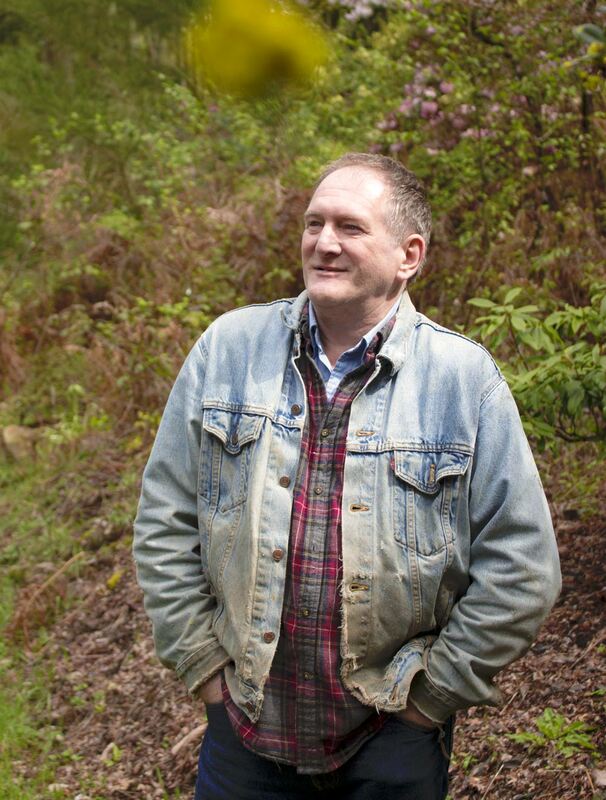 Regarding Bender’s magnolia frenzy, Navage said, “Yes, he caught the bug.” Navage explains that part of the fascination with magnolias is the recent discovery that some evergreen magnolias from subtropical areas, like Vietnam, are proving hardy in the local temperate climate. 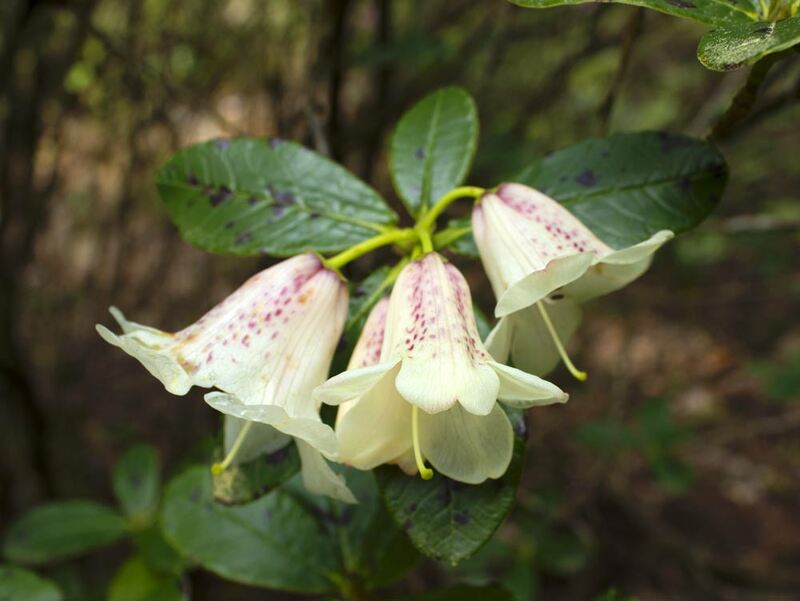 This also opens new possibilities for hybridization. 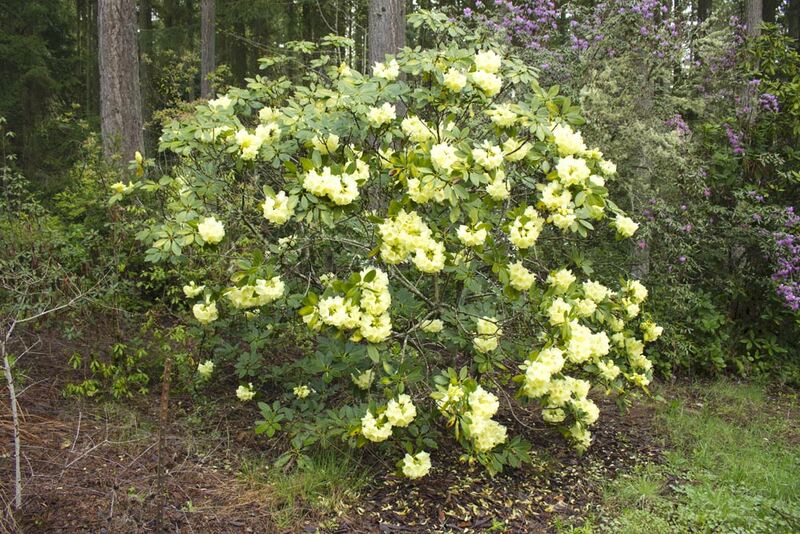 Bender is particularly enthusiastic about a small evergreen shrub with little white flowers. Formerly called michelia, it was recently reclassified as a magnolia. He plans to cross it with some of his magnolias. 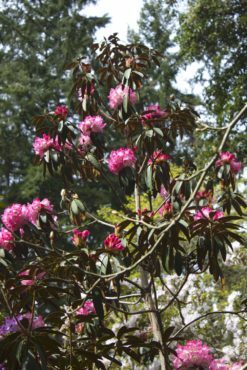 He has visions of hybrids that have the colorful flowers of the tall magnolias but the more garden-friendly size of the michelia shrub. On a sunny slope, Bender grows peonies. “They like the heat,” he said. 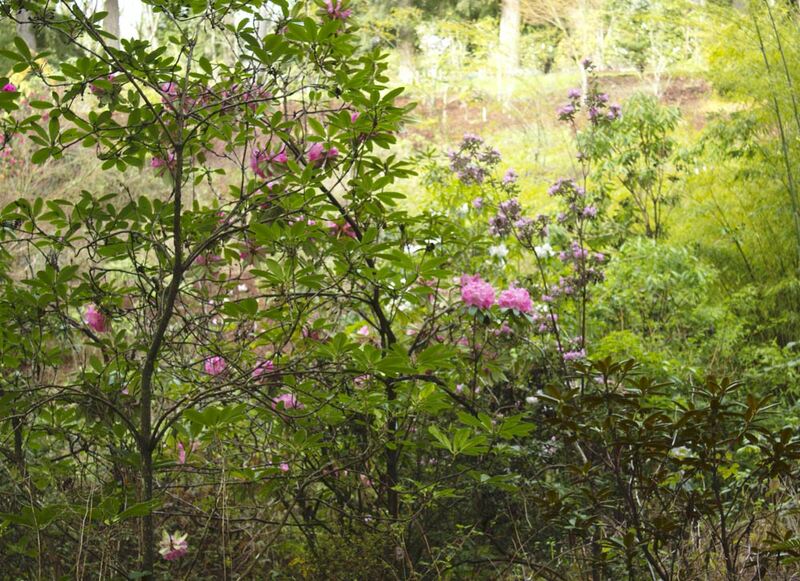 He collects both herbaceous and tree peonies from around the world. He was excited that some tree peonies he bought from a source in China, labeled only as “unknown red,” turned out to be a very rare Paeonia qiui. 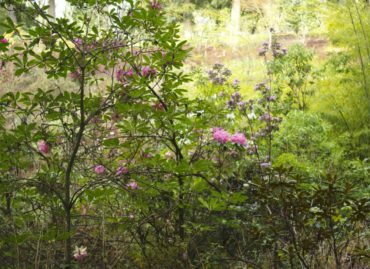 Among the herbaceous peonies, he grows P. veitchii, native to China; P. emodi (ranges from Afghanistan to Tibet and Nepal) and P. corsica, from hot Mediterranean areas. 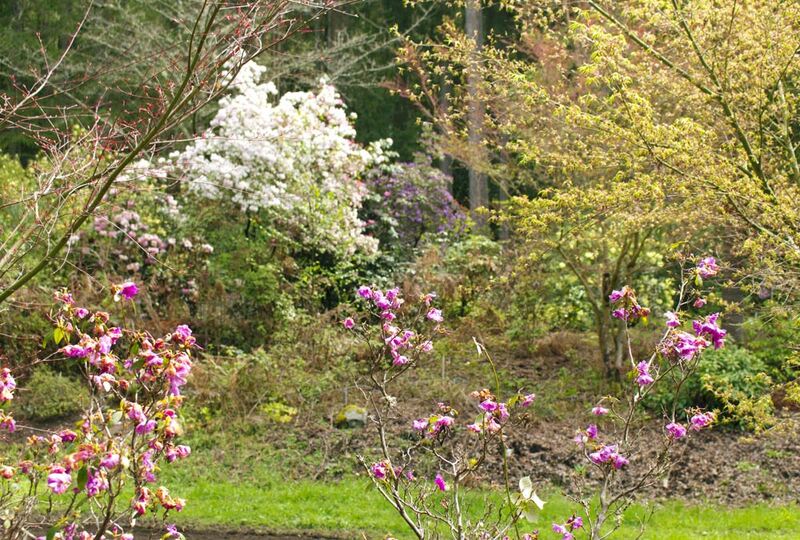 Daphnes, viburnums and Pacific Coast irises also have a significant presence. 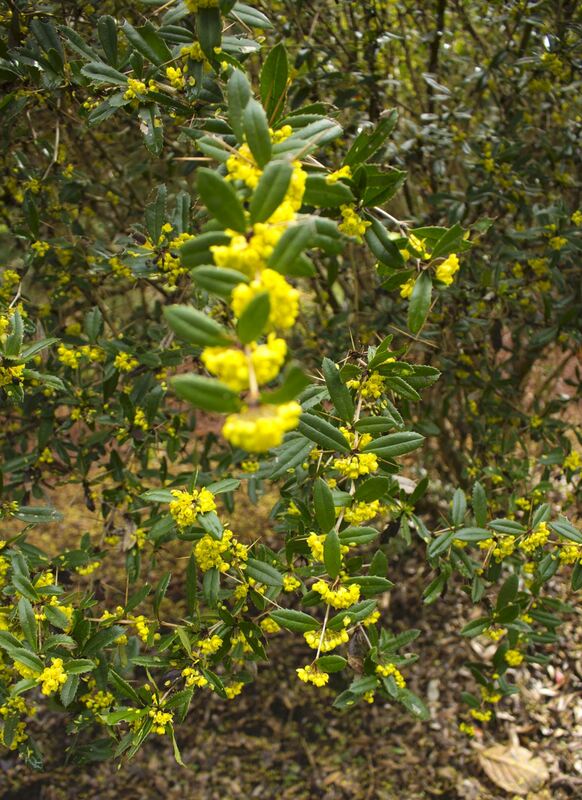 Bender said he has about 85 different daphnes, including the fragrant Daphne bholua, which blooms in January. He limits his viburnum selections to only those with fragrance. Taking advantage of having well-draining, relatively sandy soil, he collects Pacific Coast irises, which need very good drainage. Recently, Bender turned his attention to two areas of the property that are particularly hot and dry. “I don’t water, so I need some tough things,” he said. He has planted pink and yellow bottlebrush (Callistemon pallidus and C. lilacinus), tea tree (Leptospermum), bush clover (Lespedeza), New Zealand iris and all the grevilleas that he could find. He found a grower in Chile who will send him seeds of plants from the dry, inland areas of that country. Now Bender wants to learn how to grow cactus from seed. Nature has had millions of years to figure out how to do it right, Bender figures. He leaves the dead flower stalks on dahlias until the new leaves begin to emerge in spring. 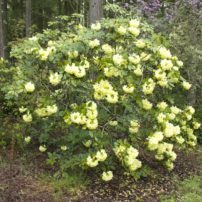 He said that cutting them down in the fall allows cold rain to enter the hollow-cut stems, causing the tubers to rot and freeze. He doesn’t trim the ratty, old leaves off his hellebores. 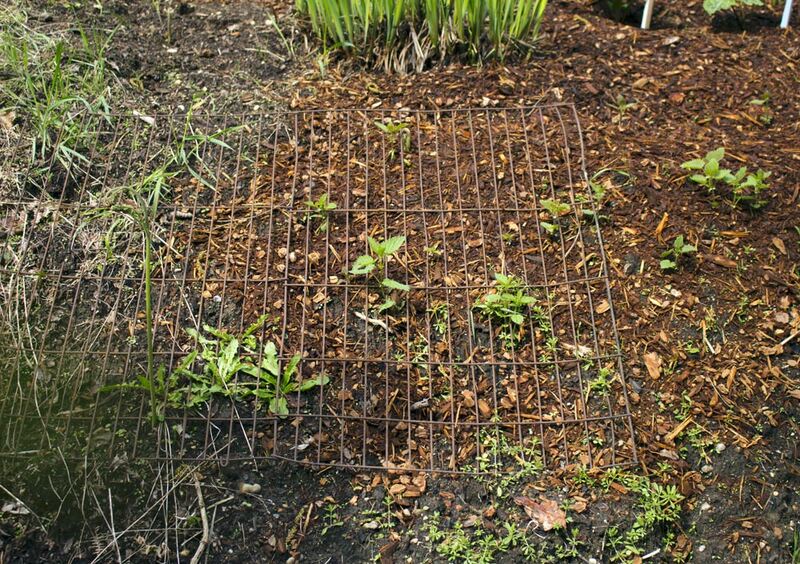 A metal grid helps keep deer away. 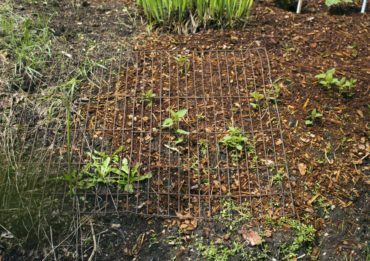 “When I leave them on, I get a ton of new seedlings,” he explained. One whole hillside will soon be naturalized with hellebores. Except for a few small, fenced areas, deer pretty much have free access. They don’t munch much of what Bender grows. But they do leave their mark. Quite a few young trunks have bark shredded off one side and branches missing at antler height. “They’re cleaning their antlers,” Bender said. He obstructs them with poles around tender trunks, and lays sections of wire fencing on the ground around the more vulnerable plants. The deer don’t like stepping on the metal grid. Not elegant, but effective. And each year, a doe brings her young through. “Usually they’re close enough, you can almost touch them,” he said. Birds love it here. A chorus of bird song provides a constant soundtrack. When in bloom, his Chilean fire tree attracts droves of hummingbirds. Instead of cutting a few old conifers to the ground, he left some 30-foot bare trunks, or snags, for the woodpeckers. Bender’s newest interest is hunting for garden-worthy native plants in roadside ditches. He learned that it’s permissible to dig plants from ditches that will be dug up by imminent road work. Someone he knows works on road crews on the Olympic Peninsula and lets him know where and when work is planned. Bender then goes out ahead of the crew, bringing his buckets of soil, and searches for interesting specimens. Last year he found “something that looks like an aster but has a leaf like lamb’s ear” and it’s not in any of his books. 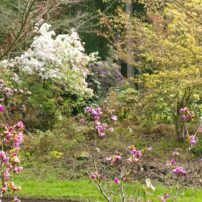 A freelance writer and professional garden designer who lives in Poulsbo, Maia is a member of the Garden Writers Association. 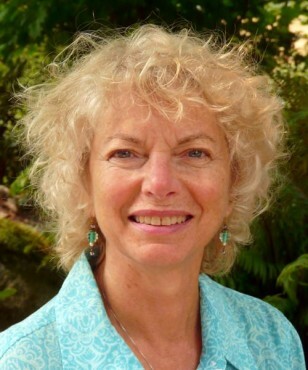 She writes about gardening, travel, people and living well and wisely on the planet. As a garden designer, she specializes in container gardens.